It feels like forever ago that we first wrote about Burger Theory. Almost a year has gone by, and since then they've been names Australia's tastiest burger, been at various locations in the CBD almost daily, and are practically a household name. They menu has changed, and Pearl's been given a new paint job, so we thought it was about time we revisited Burger Theory. 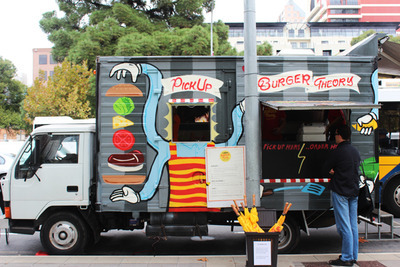 If you need a bit of a recap, The Burger Theory food truck was one of the first to hit the streets in Adelaide's new wave of mobile food vendors. They do a pretty regular rotation of spots around Adelaide, keeping office workers fed and full during lunch hour. 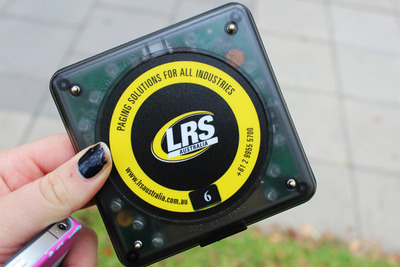 You line up, place your order, and are handed a small square pager. When it buzzes your order is ready, and you can enjoy. The menu at Burger Theory has been condensed, but it's also seen a few more options added. The burritos are gone, and as much as we all might have hoped the pulled pork and lamb burgers haven't become regulars. Thankfully Burger No. 1 and Burger No. 2 are both worthy choices. Burger No. 1 is served on a Breadtop bun; the buns have that sweetness to them that shouldn't work, but totally does. 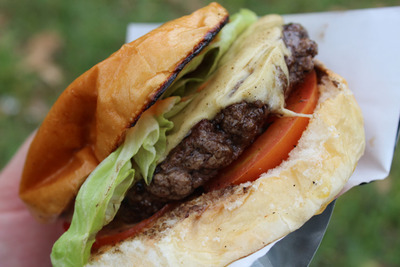 There's the Coorong Angus Beef patty, cooked medium, iceberg lettuce, tomato, American cheese, and the tasty truck sauce. On paper it sounds like a regular burger, but there's something about the combination of flavours that really goes off in your mouth. It's the safe option, but thankfully it's not any less tasty than Burger No. 2. Burger No. 2: same meat, same bun. On top of this you've got crispy pancetta, onion confit, and Adelaide Blue cheese sauce. 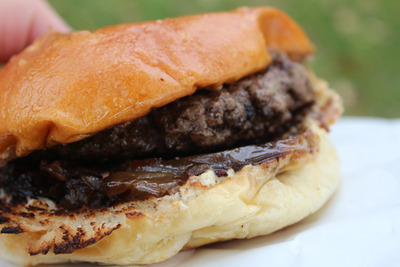 This is the fancy burger, and it'll set you back an extra $2. You're really torn between savouring the flavours and demolishing the burger in three swift bites. When you're given these two choices it's quite tempting to have a showdown, order both and see which one wins. Unfortunately even after you've eaten your fill of both burgers, there's still no clear winner. 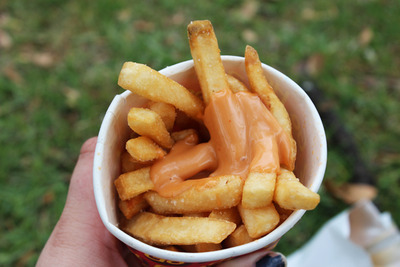 Fries seem to be permanent on the menu, and you can get them with ketchup or truck sauce. The truck sauce is worth a try; it usually comes in a small pot, but see if you can have it drizzled over the top instead. Then it oozes down to the chips at the bottom. If you want you can add fries and a can of drink to any burger for an extra $5. They're usually in the city at least two days a week, but locations can vary. You can track them down using the calendar on their website, or by following them on Twitter and Facebook. They'll usually post their location before they set up for the day. They were part of Clipsal and Womad this year, and also should have a regular gig at the Adelaide Roller Derby. If you haven't had a chance to try them yet, go and see what the rest of Adelaide is making a fuss about. They're slowly becoming a normal part of the CBD, so you won't always find the endless lines that were frequent in the early days. If you've tried Burger Theory, and liked it, why not let the Adelaide City Council know? They've supported the mobile food vendors across the CBD, and lets hope that support stays strong.